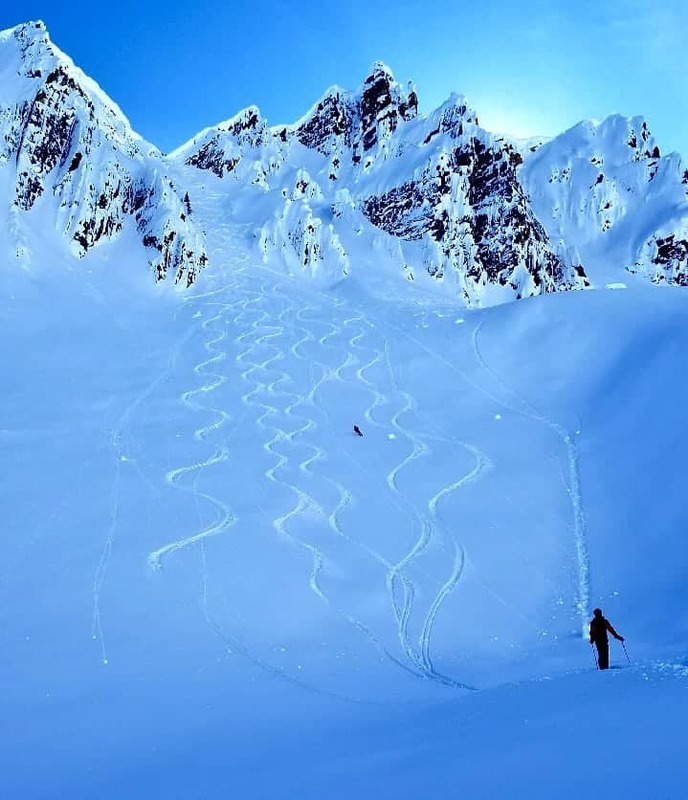 Cold smoke, bottomless, pow pow, blower, freshies, champagne pow, you name it, whatever word you want to use, the Powder Highway in British Columbia, Canada can be relied upon to deliver! 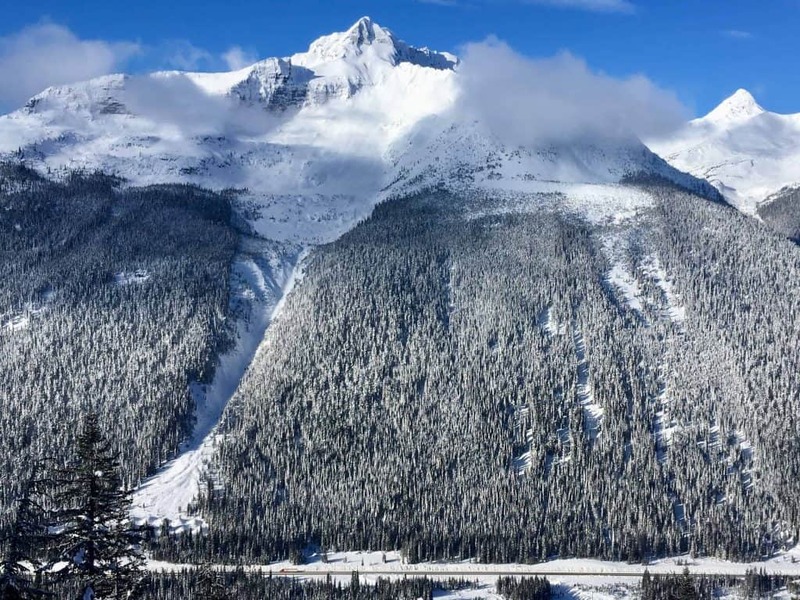 It’s the Kootenay Rockies after all and for the past week, myself (Dave, TMS Owner) and 5 of my ski buddies called Golden, BC our home. Golden, often described as the town where mountains scratch crystal blue skies, is at the confluence of 2 major rivers, is sandwiched by the Canadian Rockies and the Selkirks and provides an unlimited array of options for the backcountry ski touring crowd. Full disclaimer here that this is going to turn into a pretty picture blog post pretty quickly. If you have any specific questions about our itinerary or ski choices, hit me up in the comments and I will answer there! So, without further delay, let’s get the pretty pictures going! Q: You didn’t go to a HUT??? 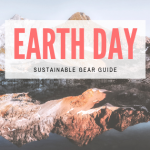 Why did you choose to rent a house in town and drive to different backcountry destinations everyday? 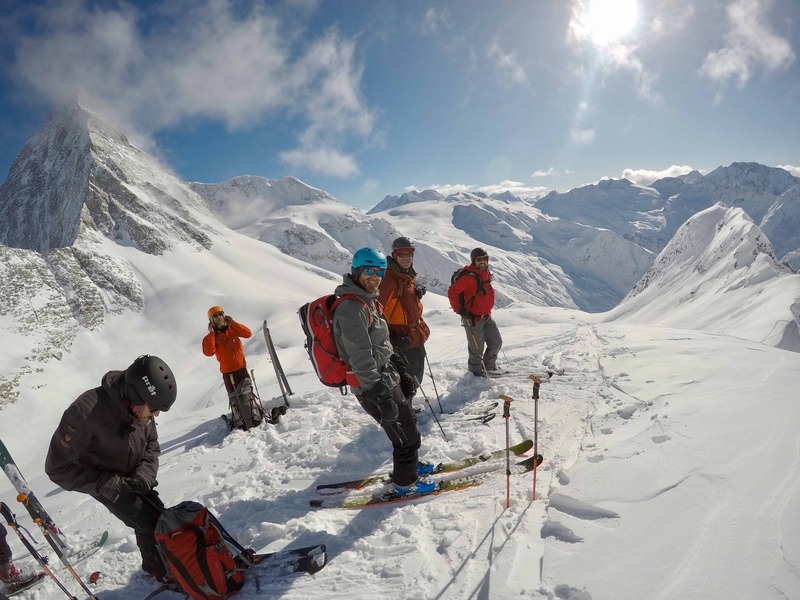 2 Answers: 1) It allowed us a huge amount of variety in places to tour, weather to experience and pow to chase. 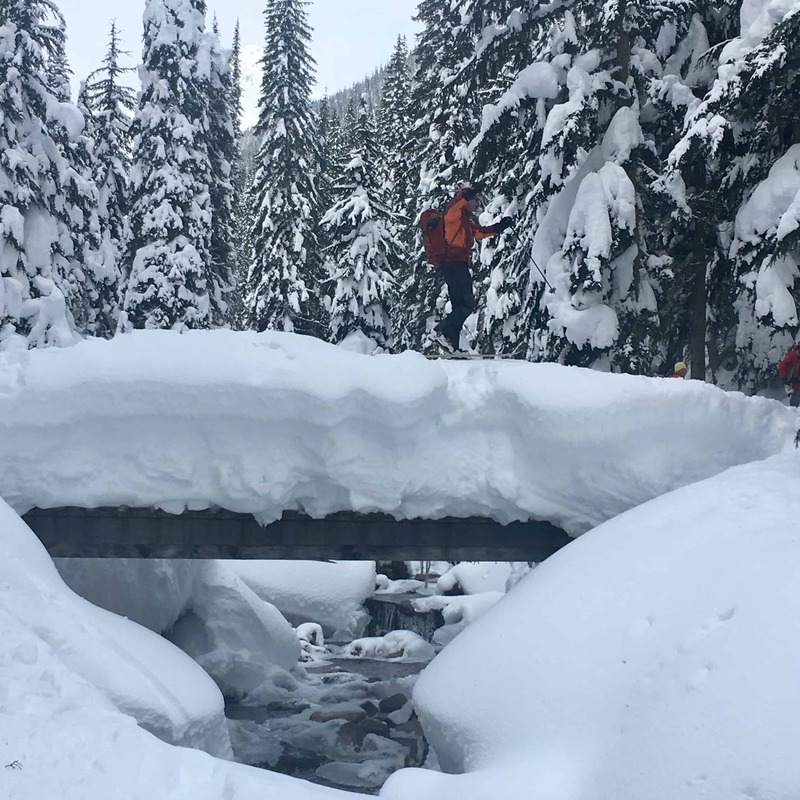 Without being locked into a hut or resort, we could wander where the snow and conditions were best. 2)Because the price is right!!! For less than $1000/pp, we pulled off a fully guided 5 days, lodging, 2 days of single ride lift tickets, 2 dinners out and a hot tub! Once you add in gas (we drove from Truckee) plus groceries, add on a couple hundred if you want a full recap. 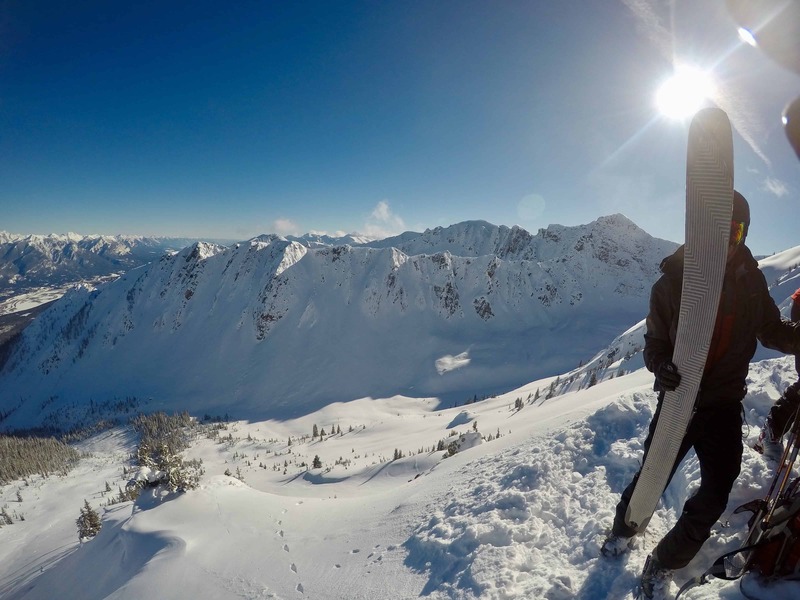 Now back to some pretty pics from days 1 and 2 which we spent riding up to the top of Kicking Horse resort and then taking off into the backcountry north of the resort. It’s basically a bunch of major ridges that have a distinct north facing aspect and south facing aspect and the ridges run east to west. It’s pretty amazing to go in and out of the sun, where it was warmer at least, and then back into the frigid north facing aspects. Yup, -20 to -30 degrees Celsius every single morning! Oh, what do you know, no tracks in this one……and no tracks in any of the others either! 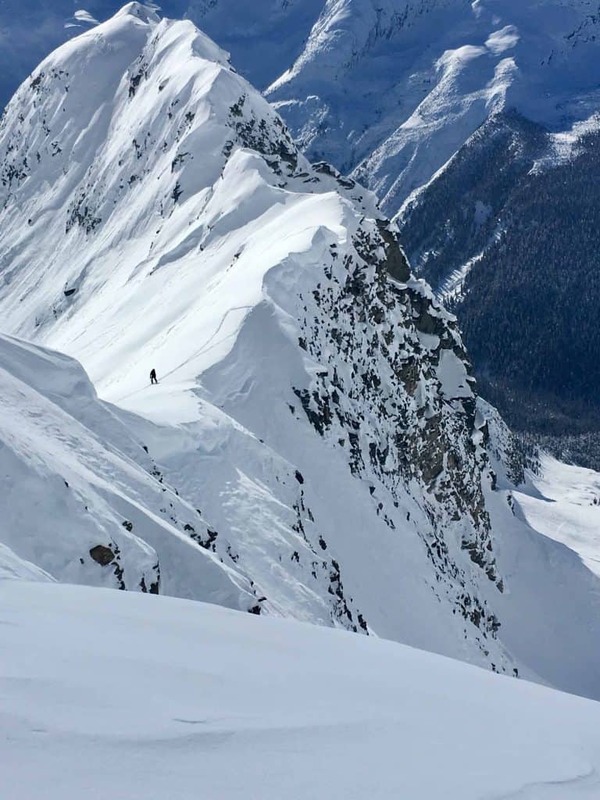 One of the many north facing couloirs that were just amazing to ski! Great stability let us really push into these lines! 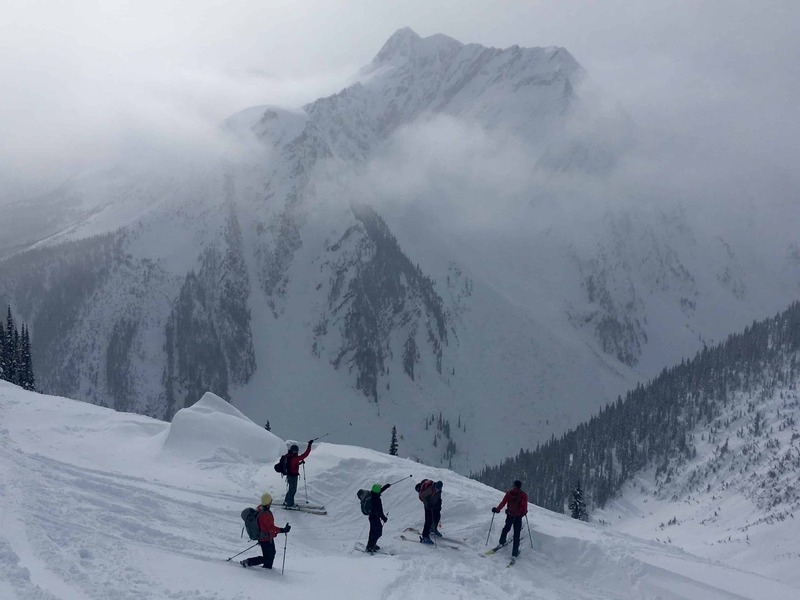 And another of those amazing north facing lines out of Kicking Horse that we got first tracks down yet again. 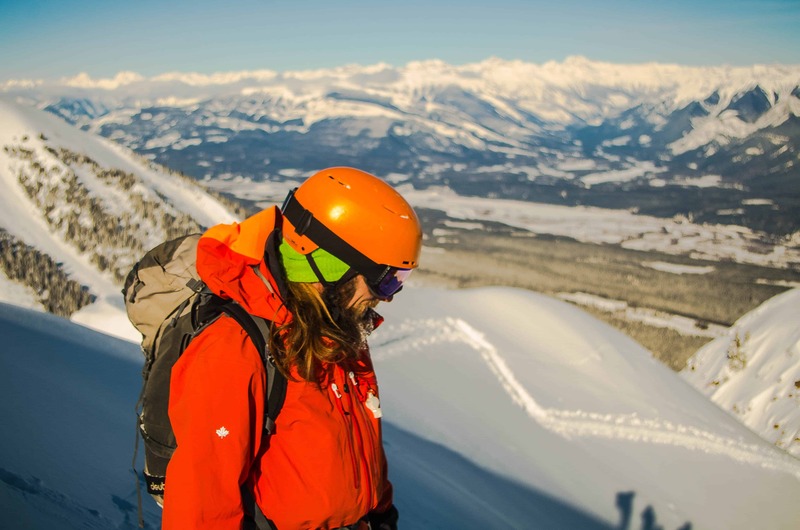 So, days 1 and 2, lift rides to the top of Kicking Horse under pretty sunny skies, increasing stability and epic, untouched powder! 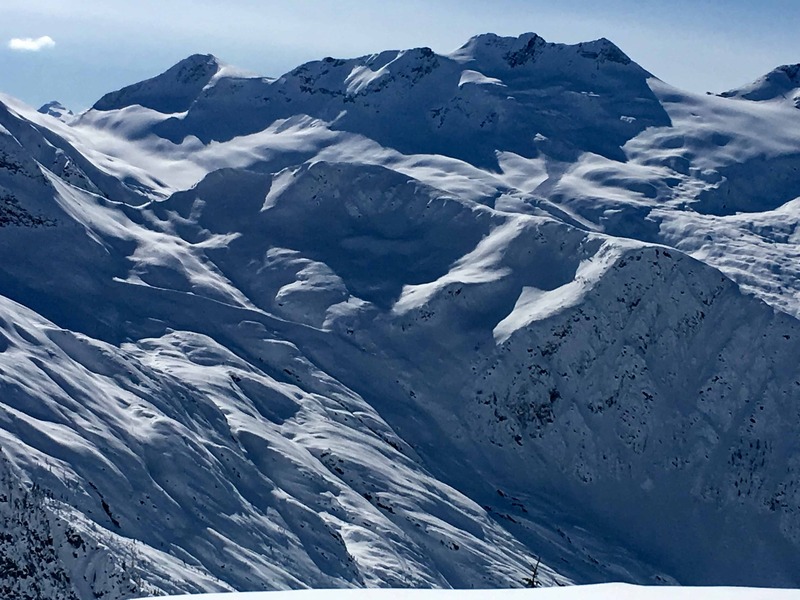 Some of the lines we skied were called Ozone, The Blunt, Wisdom Tooth, and a ton of unnamed (or at least unnamed to me) north facing couloirs and south facing glade bowls. 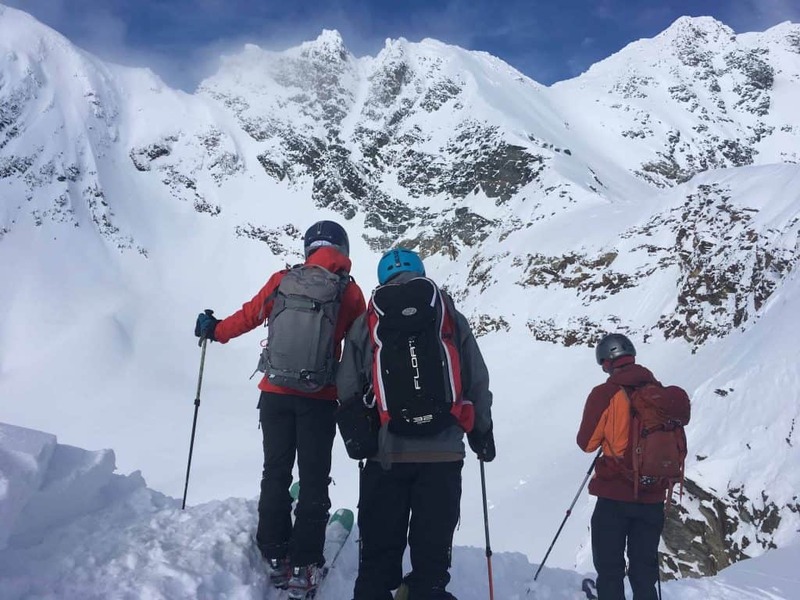 We were also lucky that our guide for the week, Aaron Enns, was a patroller at Kicking Horse for 12 years so needless to say, he knew his way around. Aaron came to us by the way of Rich and Julie from Backcountry Solutions and we highly recommend them. If you need a pro team to get your way through this area of BC, talk to Rich and Julie. 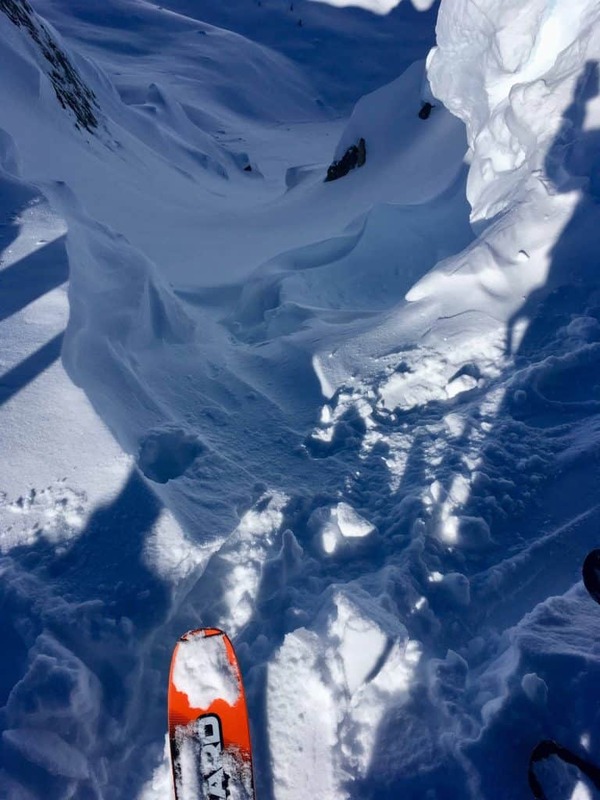 Our guide, Aaron, did have some tricks up his sleeve as evidenced by his T-anchor for cornice dropping. I didn’t get a ton of good pics of this part because the clouds came in right as we were on top, but here he is in full guide mode. 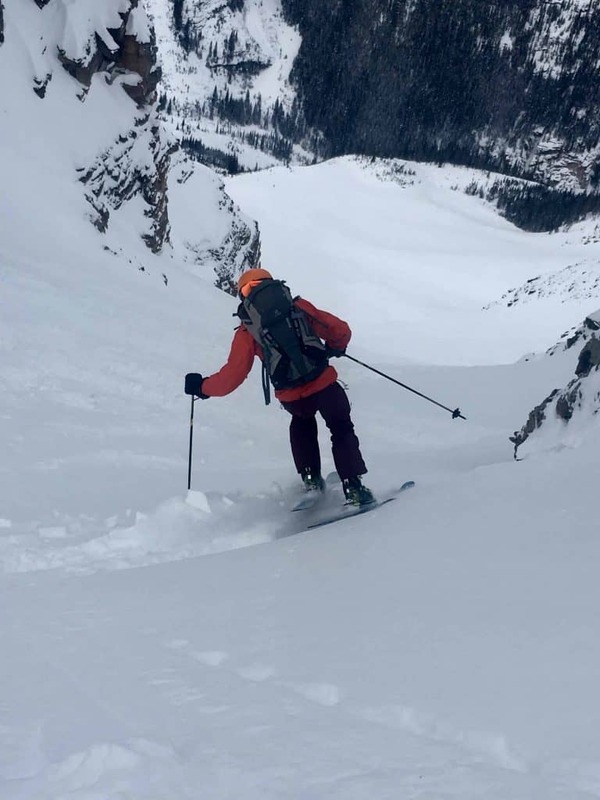 Aaron Enns, ski guide extraordinaire examining our line! More awesome pics from our second day at Kicking Horse! Days 3 and 4 were a bit more overcast to start and our plan was to head to Roger’s Pass for those days, leaving day 5 open for our choice. 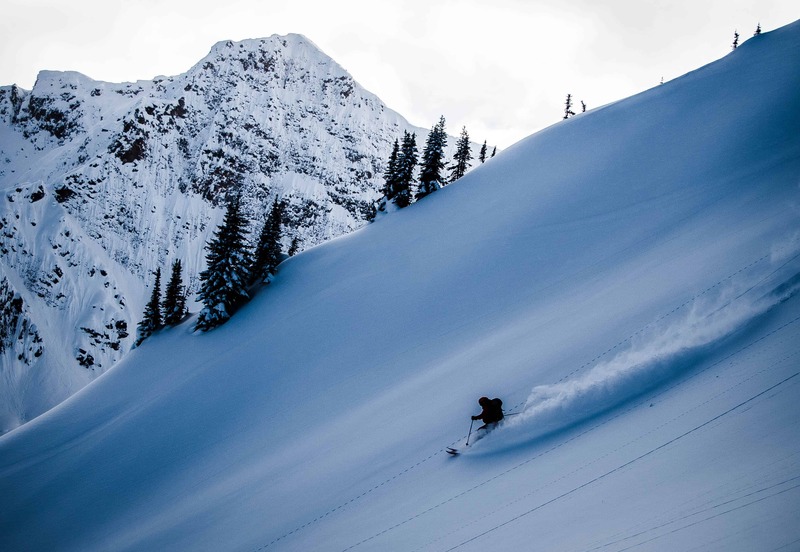 If you are a backcountry skier or rider and have not been to Roger’s Pass…….GO! 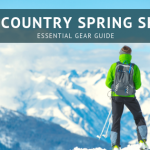 It’s pretty much the highest concentration of backcountry variety you could ever ask for. If you do go, pick up this book, its new and its the bible for that zone. I highly recommend it. 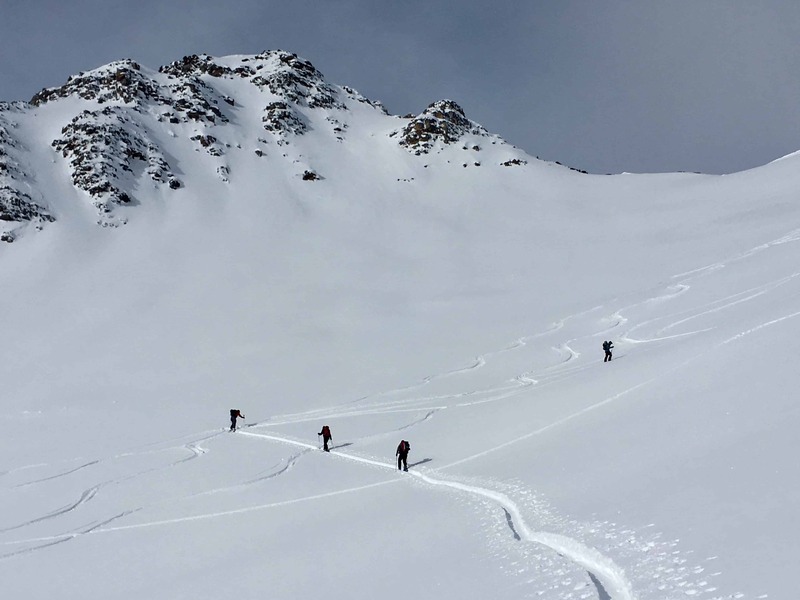 Pretty typical wind hammered up high in the Alpine and perfect snow in the nooks and crannies in between with a transition to deep, cold, glade skiing down low. 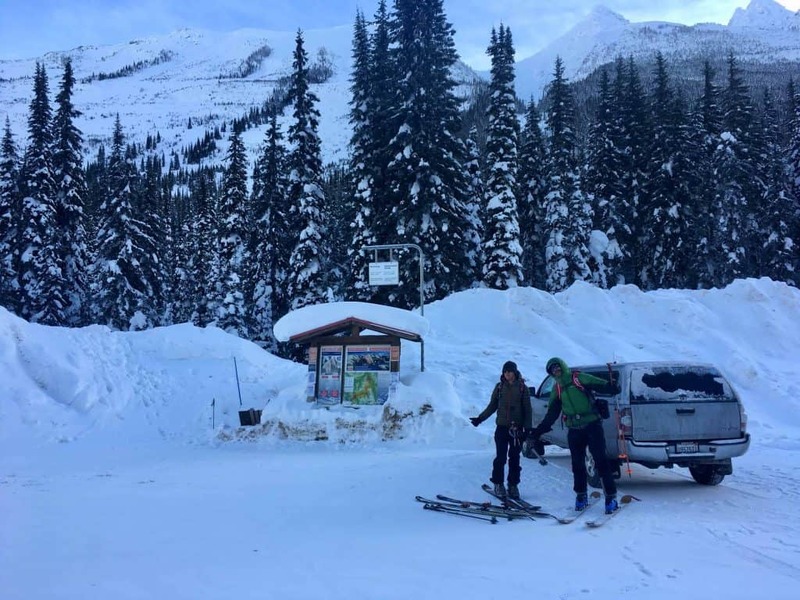 Moderate avalanche conditions at all elevations. What else could you ask for? 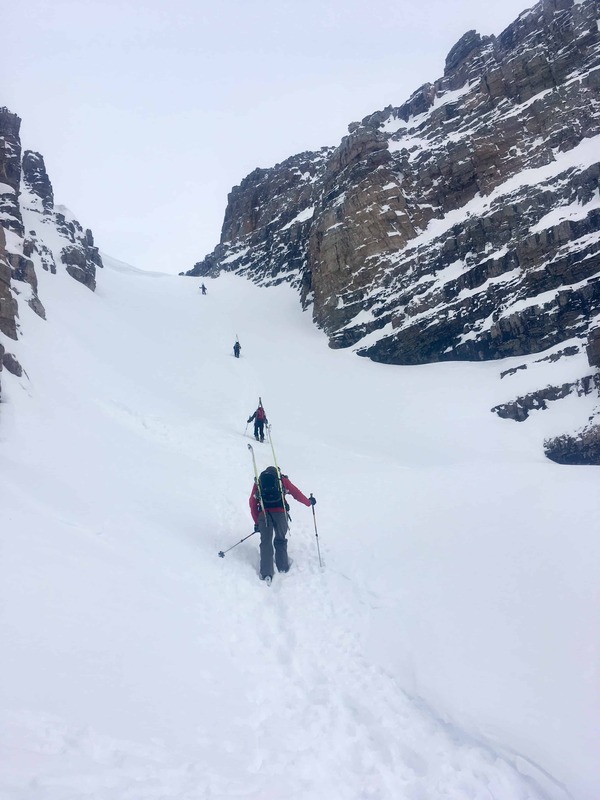 The tour up to the Overhead Bowls under Sir Donald had amazing scenery and a 40+ degree couloir to ski through to make it out the other side……..perfect! 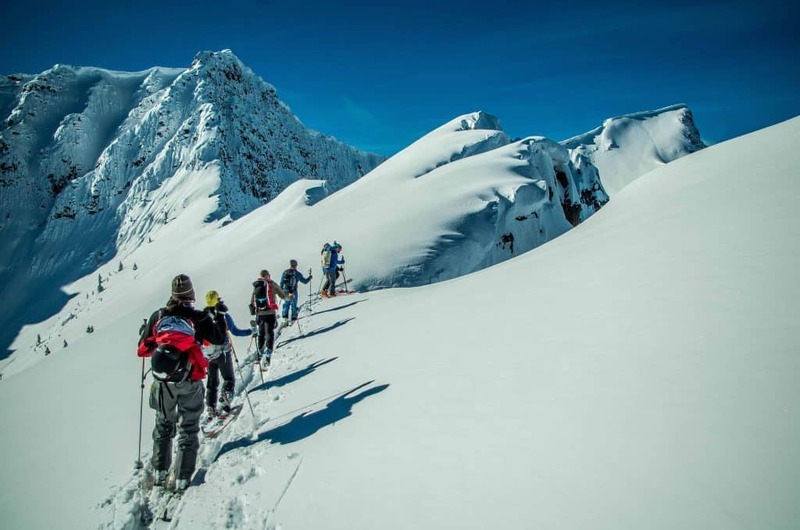 New for the 18/19 season, check out the K2 Wayback 106 for your ski touring pleasure! 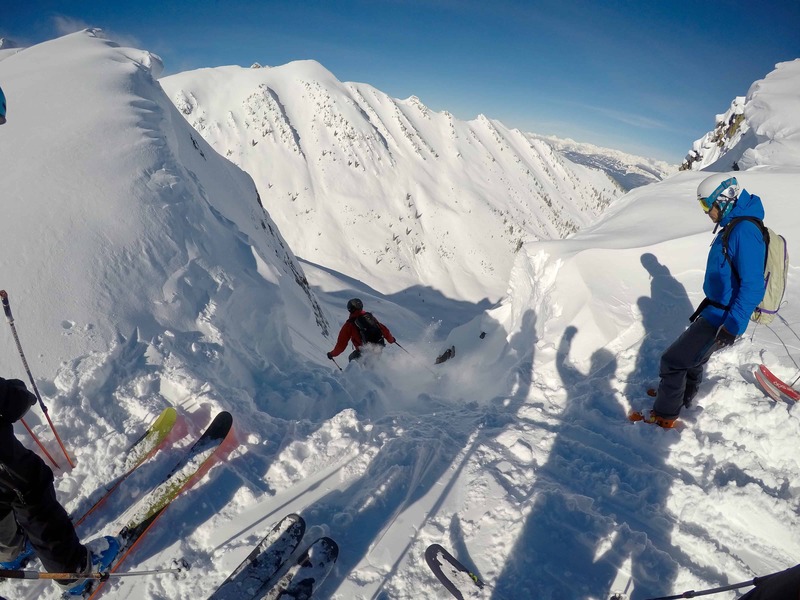 Sir Donald Peak in the background of this selfie taken with a GoPro of course! Ben Hogan photobombing me too! See that speck on the left? 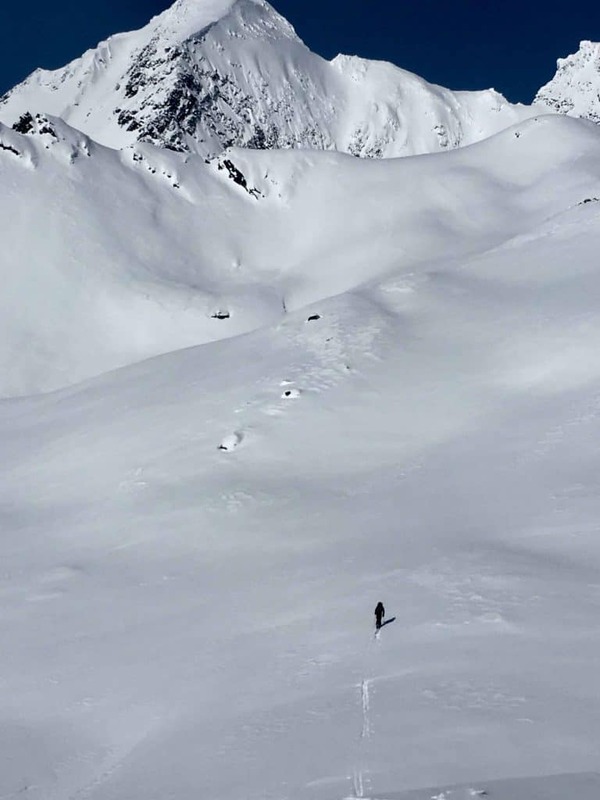 That’s our guide standing over the epic couloir we are about to ski down to get into the next drainage and head down valley. 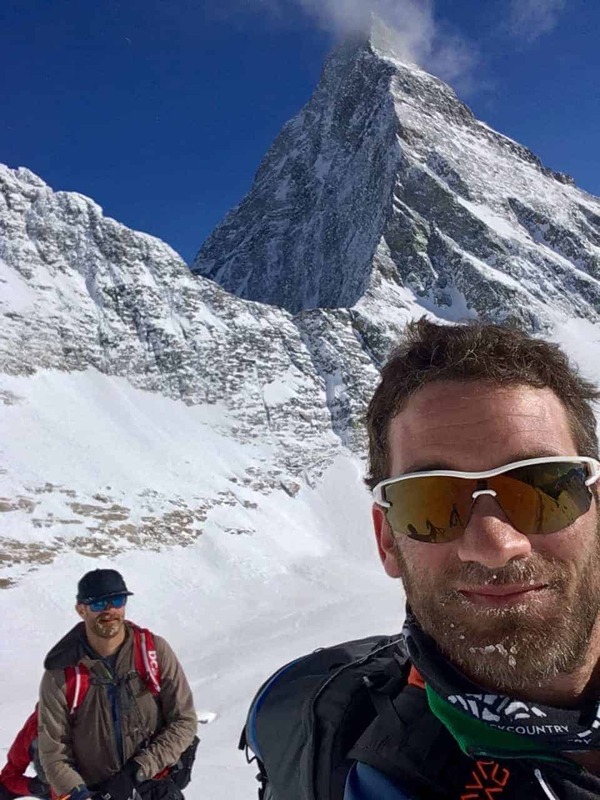 We were really lucky to have stable conditions in the alpine……and by stable I really mean wind hammered! 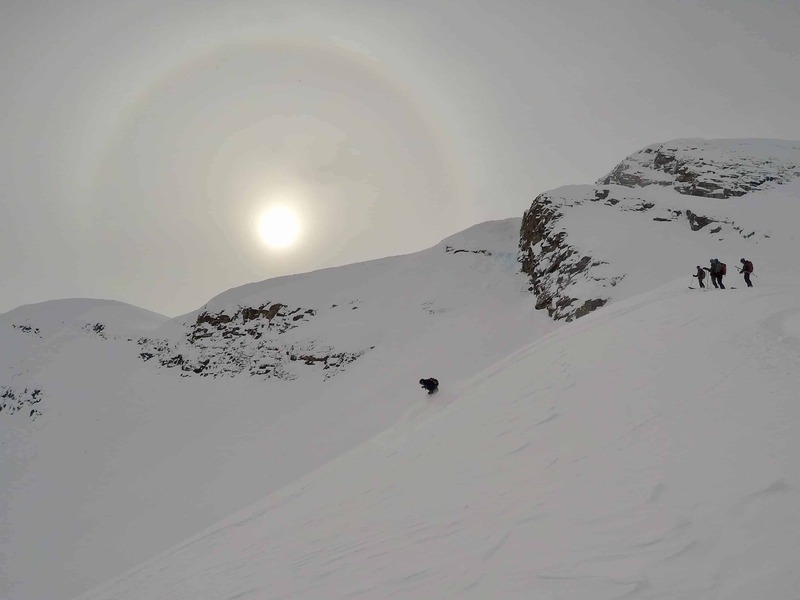 Yup, we are skiing down that windboarded 40+ degree couloir. Ok!! Here comes the sun as we were gearing up to ski back down to the trailhead. Looking out at the Canadian Rockies from the start of our tour, just as we emerged from the thick forest. 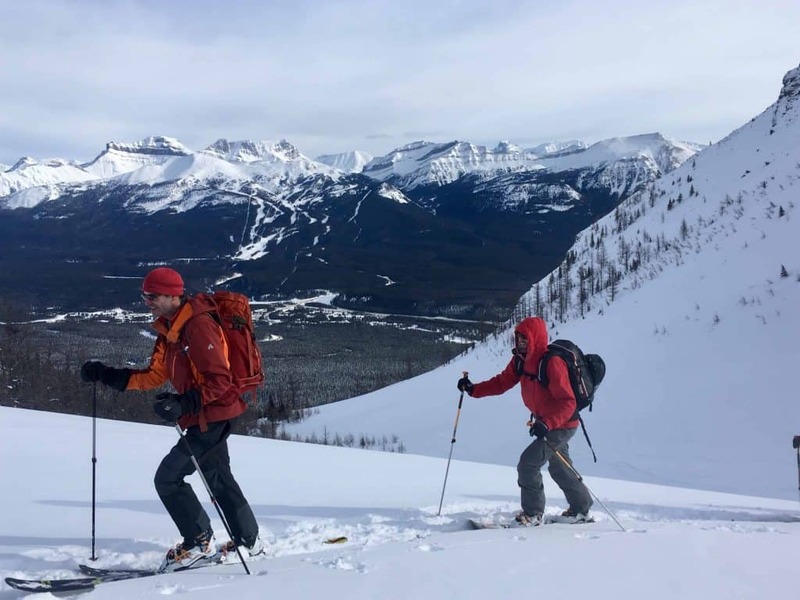 Jeff and Zack skinning along with more mountains all around us! And yes, the Rockies are about 10 degrees colder than the Selkirks, so this meant, ehhhh, maybe about 5 degs F.
Heading up to our first ski run of the day on this tour. This was the surprise Aaron was holding at the end for us. We had to bootback up a few hundred feet to get out of the drainage we were in and back over into the exit zone. It was a pretty easy bootpack after all. 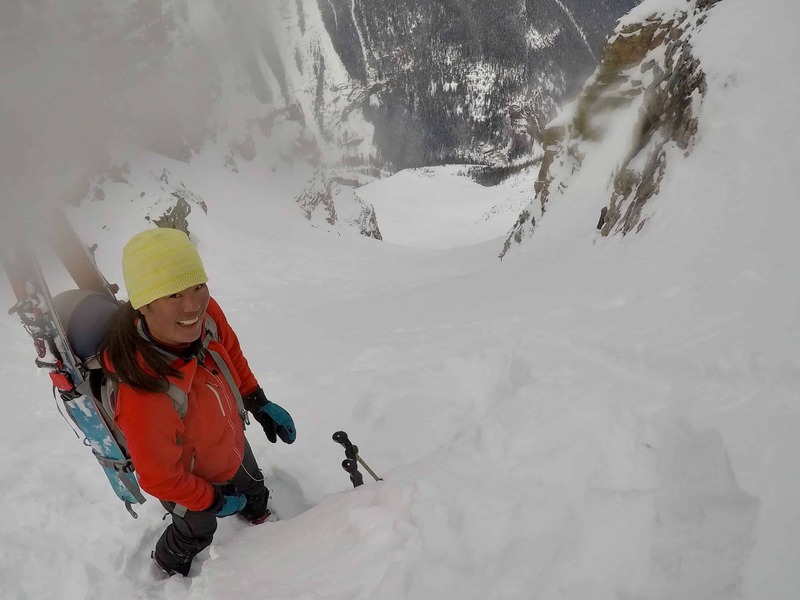 Sara is stoked she made it to the top of the bootpack and is now looking down at our ski objective. About 2500 vert of direct, somewhat variable, perfect lines! Aaron, our guide, always got to drop in first! 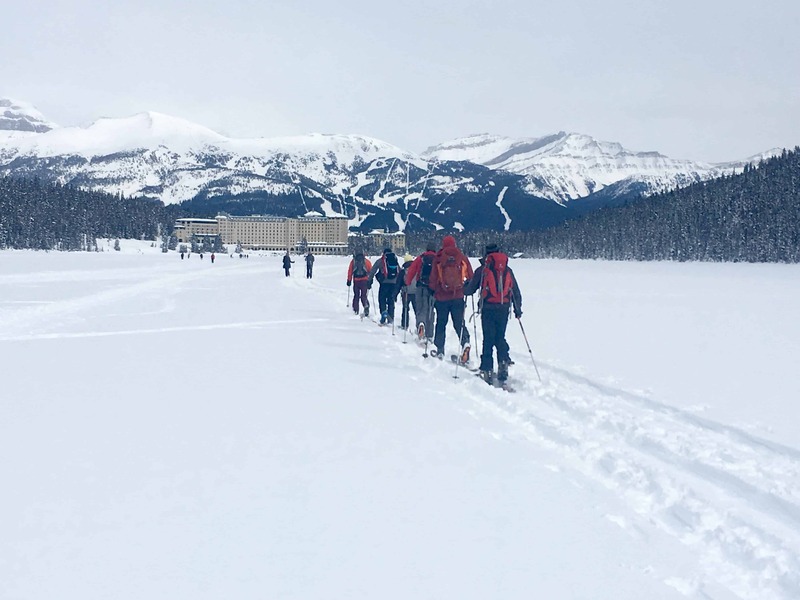 Skinning out along Lake Louise with the chateau in the background where throngs of gapers oogle at the grey sky trying to see glaciers and ice in the distance! It is always surreal when you are in the backcountry solitude for an entire day and you finish up at a trailhead like this. What skis did I bring???? Always the question. 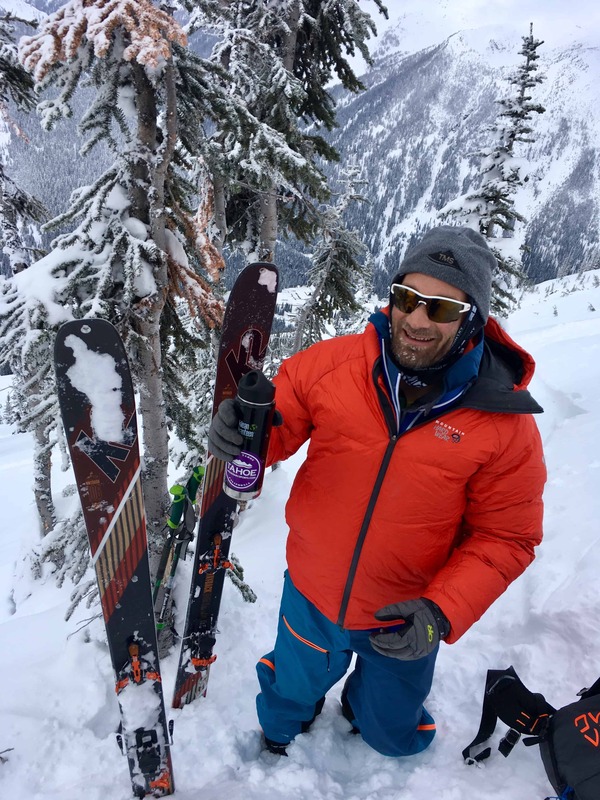 Here is my trip quiver below, but please remember, I can choose whatever skis I want because I have an entire demo fleet at my disposal and we drove, meaning, we can bring as much stuff as we wanted! 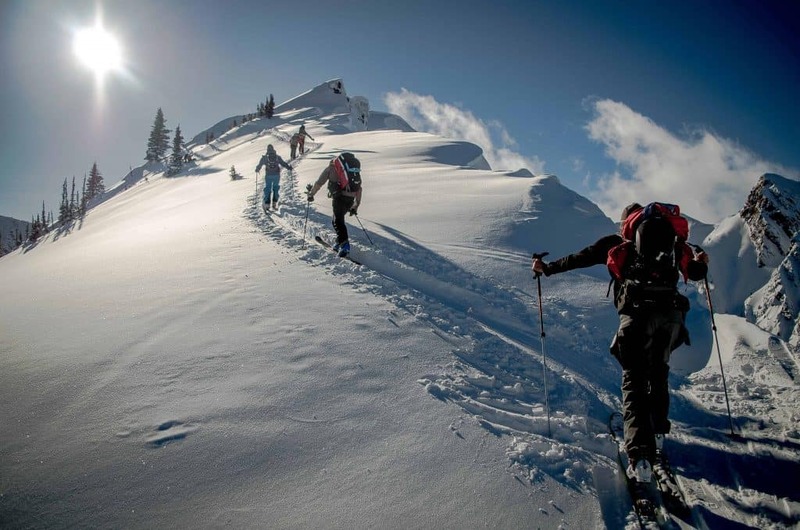 My recommendation, 2 pairs of skis tops, an everyday workhorse around 105-110 underfoot and a pair of pow skis! 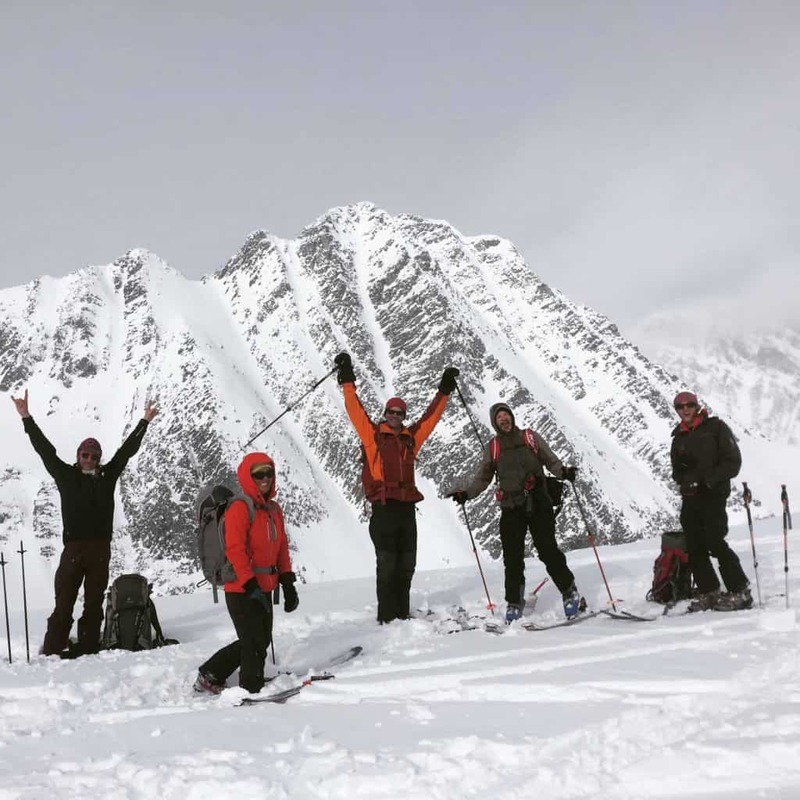 Skis: Blizzard Zero G 108s (Tried and True. I brought them because if I need a trusty sidekick, these are they.) 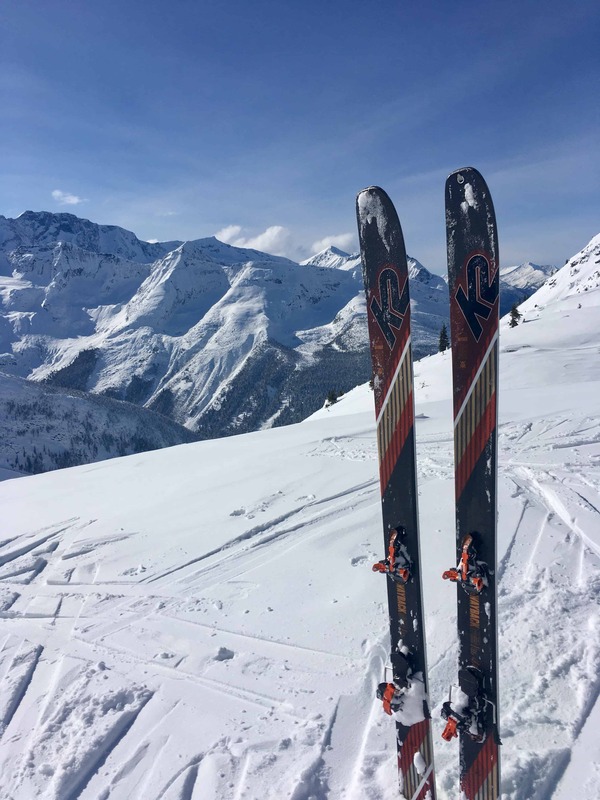 K2 Wayback 106 (Brand new for the 18/19 season, this carbon ski with titanal underfoot is going to be a quiver killer!) and of course, my trusty Black Diamond Carbon Megawatts because a pow trip is not complete without a pow ski! Boots: Scott Cosmos 3 for my harder charging days and Scarpa F1 for the longer touring days on Roger’s Pass. Clothing and Pack Ortovox everything of course!! They support TMS pretty solidly so the least I can do is reciprocate by wearing all their gear including the new Avabag avalanche Airbag. Item I couldn’t be without: Klean Kanteen insulated bottle for the tea that warmed my insides when we took breaks in the skin track daily. The group departed Saturday morning but because Ben, Peter and I couldn’t get enough, we did another quick trip up to Roger’s Pass before the start of the 20 hour drive. We hit up the NRC ridge across from Cheops and it was mighty fine! The parking lot on an early Saturday morning at the base of the NRC lines didn’t disappoint! We were the only ones in that zone all day. 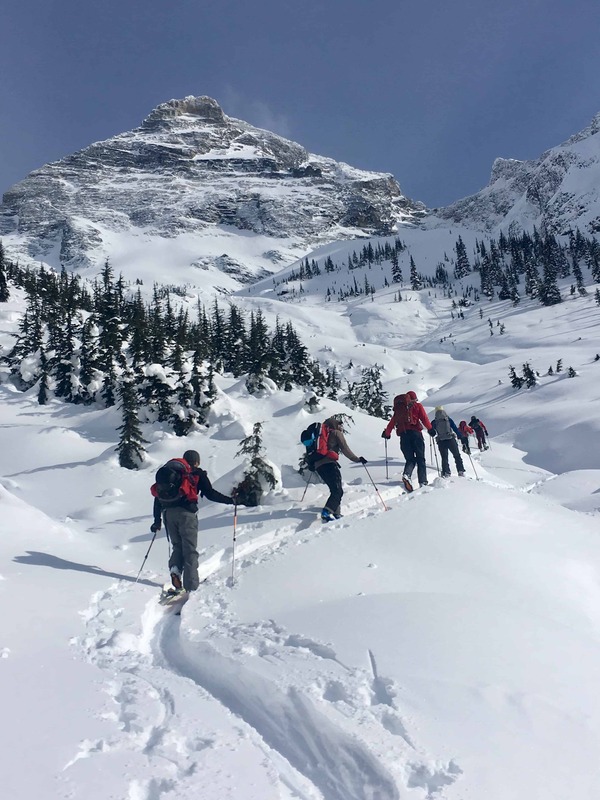 Roger’s Pass is so immense that even on a Saturday in mid-Winter, we didn’t see a sole. You pretty much hike up straight across from the glorious Mt. Cheops the entire time you are skinning for this line. And finally, a pic of me enjoying my tea during a short break on the last day….all bundled up….because it was COLD!! 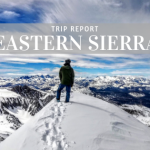 Hope you enjoyed the trip report, if you have any questions, leave a comment below!